Lady Shelia Stable's Matt King Coal survived a stretch duel with Afleet Willy and an inquiry and objection to win Saturday's $75,000 Harrison Johnson at Laurel Park. 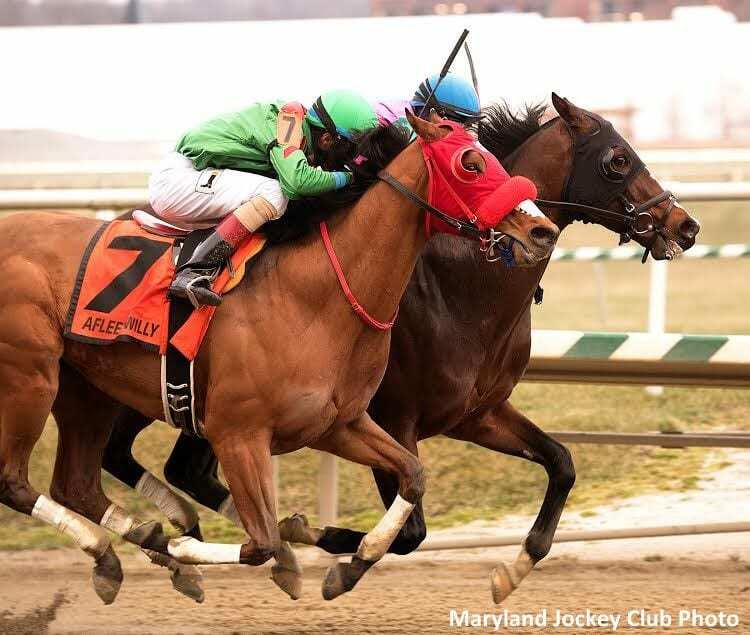 The 32nd running of the Harrison Johnson for 3-year-olds and up at 1 1/8 miles and the $75,000 Not For Love and $75,000 Conniver for Maryland-bred/sired sprinters 4 and older were among five stakes worth $425,000 in purses on an 11-race Maryland Jockey Club Celebration Day program. Also run were the $100,000 Private Terms for 3-year-olds and the $100,000 Caesar's Wish for 3-year-old fillies, both at about 1 1/16 miles, along with Laurel's inaugural Fantasy Owners Day designed as an introduction to prospective Thoroughbred owners. Matt King Coal, a son of Cool Coal Man and the 4-5 favorite, was making his second start of the year. He won his 4-year-old debut at Laurel Feb. 18 for trainer Linda Rice. Breaking from the No. 9 post in the Harrison Johnson, Matt King Coal left running and was taken to the front by Karamanos and set fractions of :25.01, :50.27 and 1:14.58 while Afleet Willy and jockey Victor Carrasco sat behind the leader. “He shot out of the gate,” Karamanos said of Matt King Coal. Entering the stretch Afleet Willy drew alongside Matt King Coal and the race was on. The two raced gamely side-by-side, with some contact down the stretch, before Matt King Coal got the win by a nose while covering the distance in 1:51.07. MCA Racing Stable's veteran campaigner Next Best Thing split horses leaving the backstretch, opened a clear lead down the lane and held off late-running If I Was a Boy to win the $75,000 Conniver by a length. It was the first stakes victory for jockey Katie Davis, who escaped injury in a late-race spill one week ago, and Next Best Thing ($8.60), a 7-year-old mare making her 55th lifetime start for meet-leading trainer Claudio Gonzalez. One Proud Gal ran the first quarter-mile in 24.34 seconds with 4-5 favorite Bawlmer Hon and Next Best Thing right behind. Davis, aboard for a one-mile optional claiming win March 4 at Laurel last time out, guided Next Best Thing between One Proud Gal and Bawlmer Hon after a half in 47.86 and took over the top spot, extending their lead around the turn. Davis kept busy on Next Best Thing in the final furlong as If I Was a Boy made a late run along the inside but held sway, finishing in 1:24.40. Bawlmer Hon was 3 ½ lengths behind If I Was a Boy in third. This entry was posted in Racing and tagged Cool Coal Man, harrison johnson stakes, horacio karamanos, laurel park, Linda Rice, matt king coal by Press Release. Bookmark the permalink.